When our house was built a few years ago (after our house fire), one of the things I wanted was a house wired for Ethernet connectivity. Unfortunately, the contractor must not have realized that running CAT5e isn't the same as running power lines. Although my house did in fact have RJ-45 jacks in a few rooms, opening the wall panel exposed approximately three inches of untwisted wire crammed into the wall jack. Even worse, they stapled, yes stapled, the CAT3 cable to the wall studs. When asked about the CAT3 wiring, mess of untwisted wire and stapling, the contractor assured me that CAT3 and CAT5e are the exact same thing, and that he'd been installing Ethernet cable for longer than I've been alive. Although it was flattering that he must have assumed I was born after 1990, I decided it wasn't a battle worth fighting. I've since run Ethernet cabling throughout my house, and terminated it properly. 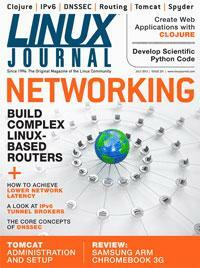 Thankfully, while this issue of Linux Journal is focused on networking, all the articles are written by experts, and none of them are stapled to the wall. Reuven M. Lerner starts things off with a bit of Clojure. Although that may sound like a counterintuitive way to start an issue, in this case, Clojure is a way to make Web applications. It's a modern variant of Lisp, and whether you love or hate Lisp, it's worth checking out Clojure. And, Dave Taylor provides us with a real bit of closure this month, as he finishes his series on Cribbage. Whether you love the game, or just love the scripting process, it's been an educational series. We get launched directly into the networking issue with Kyle Rankin's Hack and / column. Kyle starts a series on DNSSEC, which adds a much-needed layer of security to DNS. In a perfect world, DNSSEC would be unnecessary, but unfortunately, we don't live in a perfect world. I follow Kyle with my Open-Source Classroom column. If you've never been faced with deploying WAR files, or haven't ever needed to install any Java applications, Tomcat might be confusing and foreign to you. I hope to clear some of that up this month with a primer on deploying Java on your server. We dive in to hard-core networking next with Igor Partola's article on IPv6 tunnel brokers. If you participated in the IPv6 poll, you might be interested in setting up IPv6, and Igor explains how to do that, whether your ISP supports it or not. Speaking of ISPs, Dan Siemon shows how to look at network latency as opposed to bandwidth for measuring network performance. ISPs offer higher and higher bandwidth, but network engineers (and on-line gamers) know that there's more to the network than just speed. Dan describes how to deal with latency in our Linux systems. Next, Michal Ludvig takes us on a trip to his Pacific island, where bandwidth comes either slow and expensive, or fast and insanely expensive. Thankfully with Linux, he can do some advanced routing to leverage multiple ISPs for maximum savings. If you need to load balance WAN connections, or if you just want to utilize your multiple connections better, Michal's article will be extremely useful. Bill Childers is back this month with his review of the Samsung ARM-based Chromebook. I just bought the same model notebook, and I learned a lot from Bill's article. I wasn't sure if I'd love or hate a Chromebook, but Bill shows how to do a little more than Google intended. It's pretty awesome. Doc Searls finishes our issue off with a look at television. Are we approaching a major departure from TV as we know it? Looking at my house with its XBMC devices, Internet TV and streaming-only entertainment, I'd say yes. Doc agrees, and he goes into detail on what's to come. I have a passion for networking, and this issue really piques my interest. It's hard to pick up the networking issue of Linux Journal and not learn something, but if nothing else, hopefully you've learned never to have a contractor install your Ethernet cabling—unless your contractor has a Linux Journal bumper sticker. Then he or she might be okay!